This material is based upon work supported by the Federal Motor Carrier Safety Administration under a grant/cooperative agreement/subaward. Any opinions, findings, conclusions or recommendations expressed in this publication are those of the authors and do not necessarily reflect the view of the Federal Motor Carrier Safety Administration and/or the U.S. Department of Transportation. CMV enforcement community, trade and public-sector associations, transportation safety professionals and the various segments within the motor carrier industry, created an organization to assist with the implementation and coordination of uniform roadside truck and bus inspection activities – CVSA. A critical development occurred in the late 1980s – the creation of a set of enforcement guidelines and tolerances for uniform “out-of-service” standards for CMVs conducting interstate or interprovincial operations. These guidelines were later formally recognized as the North American Standard Out-of-Service Criteria (OOSC). Over the next several years, CVSA developed and, to this day, continues to maintain all non-regulatory elements of the North American Standard Inspection Program (such as designing and manufacturing the tools and equipment used in the roadside inspection process), procures and disseminates CVSA decals, and is the author of the certification standards, inspection procedures, operational policies, inspection bulletins, training videos, safety standards, enforcement tolerances and OOSC that government personnel use while conducting roadside CMV safety inspections and enforcement activities throughout North America. The program elements established, or building blocks, are collectively referred to as the North American Standard Inspection Program. The Building Blocks of a Successful Roadside Safety Inspection and Enforcement Program The appropriate regulating authority uses the roadside inspection and enforcement data for motor carrier enforcement and oversight. Manages motor carrier safety performance in the U.S. In 2019, it seems likely that the Federal Motor Carrier Safety Administration (FMCSA) will propose changes to its split sleeper berth rule. This is a prediction as we write this article in early January 2019. By the time CVSA publishes this piece, perhaps FMCSA will have provided us with its answer. Regardless, we have monitored this situation closely and have received a few indications that lead us to anticipate proposed changes are coming at some point this year. Let’s walk through each of these questions. In late 2018, FMCSA officials made an informal announcement at a trucking conference that the agency cancelled a long-planned flexible split sleeper berth pilot program. The original intent of the now-cancelled pilot program was to allow participating drivers to split their off-duty time in a sleeper berth within different parameters set by FMCSA (e.g.., obtaining an equivalent 10-hour off-duty break by splitting sleeper berth time into two periods of seven and three, six and four, etc., in addition to the currentlymandated eight and two hours) in order to examine whether regulatory flexibility related to the sleeper berth provision could be used to improve driver rest and alertness. See 82 FR 26236. In making the announcement, an FMCSA official stated that the agency had already collected a fair amount of data and research on this topic. The research included five reports based on the schedules of commercial motor vehicle (CMV) drivers, multiple surveys of railroad workers, an analysis of the sleep/wake schedules of astronauts (yes, astronauts) and a distribution and analysis of sleep patterns for night and nonnight workers (non-transportation). • What data and research does the agency already have? • Does the data/research lean for or against changing the split sleeper berth rules? • Will FMCSA use the data and research it collected to propose a change to the current split sleeper berth rule? Much of the research FMCSA already collected is easily found. Ironically, it was listed and described by FMCSA in a June 2017 notice officially proposing the flexible split sleeper berth pilot program. In that notice, FMCSA listed 12 different research studies and described each as either showing benefits or negative impacts of split sleep. See 82 FR 26234-35. The list was fairly impressive and indicated that FMCSA’s research office had broadened its search criteria and located potentially relevant research outside the typical trucking and motor carrier research communities. And, perhaps that’s exactly why, at the time in June 2017, FMCSA leadership decided it needed to sponsor and conduct a split sleeper berth pilot program – to generate additional trucking-specific data since less than half of the 12 cited studies evaluated the schedules of truck drivers. Showing Negative Impacts of Split Sleep for Transportation Operators.” Importantly, the report dates of the eight studies supporting the benefits of split sleep ranged from 2007 to 2013 – meaning those studies are of relatively recent vintage. Conversely, the four cited studies showing negative impacts of split sleep are significantly older, ranging from 1988 to 2002. In fact, FMCSA commented in its June 2017 pilot program notice that the findings from these four studies are potentially outdated due to advances in methods of conducting studies as well as advances in the understanding of fatigue, fatigue management and how different sleep patterns affect performance. See 82 FR 26235. At that time, FMCSA made this comment to explain and justify why the agency was revisiting the split sleeper berth provision by proposing a pilot program. As described above, in late 2018, current FMCSA leadership arrived at a different decision regarding the pilot program; presumably based, in part, on the split sleep data and research it currently possesses. And, we’d be remiss if we didn’t include the possibility of FMCSA having collected additional data and research since publishing its list of 12 studies in 2017. So, this brings us to the third and final question: Will FMCSA use the data and research it already collected and analyzed to propose changes to its current split sleeper berth rule/provision? As we stated up front, the likely answer is yes. We arrived at this answer by connecting these dots: 1. In June 2017, FMCSA proposes a split sleeper berth pilot program. The decision was made by an acting FMCSA administrator and a holdover from the Obama administration. PHMSA Preempts California Law, Giving Hazmat Drivers Relief from Delays and Security Risks By Daniel Furth, President, National Tank Truck Carriers The Pipeline and Hazardous Materials Safety Administration (PHMSA) recently determined that California’s meal and break laws conflict with the federal Hazardous Materials Regulations (HMRs) and, therefore, are preempted by the HMRs. The National Tank Truck Carriers (NTTC) filed the petition that led to this determination to alleviate confusion for hazmat drivers who couldn’t obey both state and federal law. This determination marks a major victory for the entire tank truck industry. For years, we at NTTC have argued that unnecessary delays in hazmat transportation compounds the risk to our carriers, our shippers, our professional drivers and the public at large. All stakeholders win when safety is the foremost priority and I want to credit PHMSA for asserting its authority appropriately. California applies one meal and break standard to all of the employees in the state. It requires that employees be given a 30-minute lunch break if they work more than five hours and a 10-minute break, in addition to that, for every four hours worked. These breaks, California says, should be as close as possible to the middle of the work period, and the employee must be free to take them off-premises and without responsibility for any work duties. The truck the day of the stop in Auburn, Maine. were staged. They conducted a traffic stop and inspection and placed the driver under arrest for felony theft. He was transported to the Androscoggin County jail where he was charged, and his truck and trailer were seized for further inspection. While piecing together the history of the driver and his vehicle, the real scope of his efforts to avoid regulation was revealed. He had registered his truck as a 1996 T600 with a specific VIN. However, the truck appeared to be a W900 with the visible VIN removed. The investigation revealed that he had purchased a model year 2000 W900 (ELD exempt) truck from Alabama and also obtained the title for a junked 1996 T600 (ELD exempt) from the same dealer. He brought both titles to Maine and registered the 2000 W900 as a 1996 T600, which is also known as committing Class B felony forgery with state documents. Pictured left to right: Cpl. Chris Rogers, Assistant District Attorney Pat Mador and Tpr. Jeff Degroot. Chief Derek Barrs of the Florida Highway Patrol was one of five panelists during a breakout session on the Cross Sector of Emerging Technologies at the sixth annual Florida Automated Vehicles (FAV) Summit on Nov. 27, 2018. The FAV Summit assembles industry leaders from around the world to address technologies, operations and policy issues. Its mission is to gain insight into what Florida is doing to create the ideal climate for the implementation and deployment of autonomous and connected vehicle technologies. For more information, visit www.favsummit.com. n The Oklahoma Highway Patrol conducted its first-ever internally instructed Passenger Vehicle Inspection Class on Nov. 5-7, 2018. Lt. Darrin Rose and Lt. Ron Jenkins were the instructors for the class. During the class, 14 highly trained troopers learned about the confusing world of passenger-carrying vehicles. Most students had the knowledge of what a bus was and when a “P” endorsement was required. However, new terms like private motor carrier of passengers, private motor carrier of passengers non-business and the list goes on, was a bit taxing. Then came the “special” inspection items specific to passenger-carrying vehicles: seating capacity, emergency exits and so on. A 2013 study found that 83 percent of drivers routinely took longer than 30 minutes to find parking. It is estimated that the search for safe, convenient parking annually costs the country $4.4 billion and increases CO2 emissions by 3.3 million tons. According to the National Transportation Safety Board, 30-40 percent of semi-truck related crashes are the result of driver fatigue. By using this system, drivers can monitor parking availability and make better-informed parking decisions as they near the limit of their federally mandated hours of service. “A fatigued driver can be as much of a threat on the road as an intoxicated driver,” said Indiana State Police Superintendent Doug Carter. “Helping professional drivers make informed decisions of when and where they can safely park and rest helps make Hoosier roads safer for every motorist.” INDOT will feature 19 sites in the Trucks Park Here system along Interstates 65, 69 and 70. These routes are some of the most important corridors in the U.S., with truck volumes already exceeding 25,000 trucks per day and expected to grow. These high truck volumes create congestion at parking sites, making it difficult for truck traffic to easily locate safe, convenient parking during peak rest hours. Illinois Introduces Screening System for Flat Tires at Weigh Stations By Rich Telford, Weight Enforcement Engineer, Illinois Department of Transportation; Master Sgt. Todd Armstrong, Illinois State Police; Tom Der, Vice President, ITS Solutions and Engineering, International Road Dynamics Last spring, the Illinois Department of Transportation (IDOT) and Illinois State Police (ISP) performed a site acceptance test at the I-55 Williamsville (SB) weigh station to evaluate the effectiveness of the Tire Anomaly and Classification System (TACS™), a new screening technology developed by International Road Dynamics (IRD) for identifying vehicles with flat tires. TACS uses an array of in-road sensors that measure tire “footprints.” When a vehicle passes over the sensors, data from the tires are sent to the roadside electronics. From there, the weigh station software evaluates whether a tire problem should be flagged for the vehicle. During the test period, 205 vehicles were flagged as having flat tires, one vehicle was identified with a completely missing tire and 33 vehicles had mismatched tires with a significant difference in diameter. Inspectors filled out forms to confirm that tires identified as flat by TACS met the outof-service criteria. Following the successful evaluation, IDOT commissioned IRD to expand the deployment with the installation of two more TACS at the I-55 Bolingbrook and I-70 Marshall weigh stations in October 2018. IDOT plans for three more TACS to be brought online in spring 2019. In Illinois, TACS was installed on ramps approaching weigh station facilities to identify vehicles that are unsafe due to missing, flat or mismatched diameter tires. The systems identify vehicles that meet these criteria, enabling ISP personnel to select vehicles for further inspection. Inspectors verify the tire problems and commercial motor vehicles with missing or flat tires can be placed out of service. The driver will be required to fix tire problems before leaving the inspection station. ISP sees the importance of tire safety screening, as tires are a frequent vehiclerelated factor in fatal crashes. Tire anomalies and flat tires decrease directional control, increase the risk of catastrophic failure, and negatively impact tire life and fuel economy. all commercial motor vehicles on the weigh station ramp. The Bolingbrook TACS site was deployed in October 2018 and TACS was installed at the Marshall weigh station in November 2018. Aggregated data from the three sites indicate a rate of tire anomalies of 1.37 percent. TACS is configured to identify flat tires specifically to ensure that all vehicles flagged for inspection will meet the out-of-service criteria. As expected, this results in a lower number of tire anomalies identified than the total rate of out-of-service tire problems identified in inspections.1 However, setting a higher tolerance focuses on the most unsafe vehicles and ensures that inspectors are not occupied with inspecting tires that have low pressure but do not meet the out-of-service criteria. Underinflation, especially combined with overloading, leads to tire damage that can cause blowouts and potentially crash-causing rubber debris. TACS inspections have also helped reduce the amount of road debris caused by damaged tires. This, in turn, has reduced time spent by ISP collecting the debris, which must be picked up and disposed of by the agency to ensure the safety of road users. Illinois TACS is integrated into IRD’s Operator Workstation software. Vehicles with an identified tire anomaly will automatically be directed by lane signs to report to the weigh station, and a tire anomaly warning and highlighted axle will appear on the vehicle record. If enabled, an audible alarm will sound to notify station operators of the tire issue.  ffice of Analysis, Research, and Technology O (2017). Pocket Guide to Large Truck and Bus Statistics, Federal Motor Carrier Safety Administration. Statistics indicate that state and federal inspectors identify tire defects during roadside vehicle inspections at a rate of 2.13 percent of commercial motor vehicles. In addition to providing reports on weighin-motion data, VI²M provides reporting specific to TACS. Reports and visualizations are available for hourly, daily and weekly rates of tire anomalies detected. VI²M allows the user to select the type of anomaly and will return the number, or percent, of anomalies by vehicle class. IDOT uses a web-based centralized data reporting system for monitoring TACS and weigh-in-motion systems at two sites. IRD’s Vehicle Information in Motion (VI²M™) software provides reports on overweight Class 9, or five-axle trucks, detected when the weigh stations are closed. The reports provide the total number of overweight trucks, break down those overweight trucks into 5,000-pound weight ranges and provide the amount of uncollected overweight fines and surcharges. Reports for the Marion weigh station provided rationale for adding an additional truck weight inspector to the overnight shift. IDOT plans to adopt VI²M at other interstate weigh station sites. select to view a graphic representation of the vehicle’s tire configuration. Tire anomalies flagged by TACS are indicated with red shading. Whether you are a roadside inspector, a safety investigator or a motor carrier operator, it is essential that you stay up to speed on the evolution of glider trucks. Glider trucks continue to grow in popularity among truck owners in the U.S. and one driving force is the ever-changing regulatory climate. A “glider” is the unpowered shell of a truck. The basic shell consists of a factory cab, chassis and front axle. Glider kits are available in several different options. With the basic shell, the buyer already has a second-hand engine, transmission and rear axle (powertrain and drivetrain), and needs only a new shell. A rolling glider kit is sold as the basic shell, along with the rear axles and without an engine, transmission or accessories. Finally, there is the powered glider kit, which is a shell equipped with an engine that is not new and is often called a “pre-emission” engine. Glider kits are titled as a new vehicle in the U.S. Why is the popularity of glider trucks increasing in the U.S.? With U.S. Environmental Protection Agency (EPA) emission standards entering the trucking industry in 2007 and 2011, as a result of the Clean Air Act, the popularity of glider trucks reached a new all-time high. According to “The New York Times,” production of heavyduty glider trucks was estimated at more than 10,000, or 4 percent, of all sales in 2015. However, a production limit of 300 per year, per manufacturer, took effect in 2018. This limit was due to indications that many truck owners were attempting to dodge the newly enacted EPA emissions standards by operating glider trucks with pre-emission engines. EPA’s research found that gliders emit 20 to 40 times more nitrogen oxide and soot than trucks with new engines. While there was much discussion about changes to this limit over the previous year, it remains in effect today. Side note: In Canada, glider kits are not certifiable and so they are not recommended as an option for Canadian drivers. Just as the interest in pre-emission gliders peaked, the Federal Motor Carrier Safety Administration (FMCSA) mandated that as of Dec. 18, 2017, most drivers that use paper logs had to switch to an electronic logging device (ELD). The choices are an automatic onboard recording device meeting the current requirements in § 395.15, installed before Dec. 18, 2017, or a device meeting the ELD standards found in Subpart B to Part 395 and the associated appendix. There are exceptions. One of the exceptions is drivers operating a vehicle predating model year 2000. This is due to the regulations requiring the ELD be connected to the engine control module (ECM). However, the ELD mandate did not account for the model year of the engine. If a new truck has a pre-2000 replacement engine – like in the case of a glider truck – the engine probably does not have a standard ECM to connect to an ELD and is therefore exempt from the ELD requirement. In September 2018, FMCSA published ELD FAQs that expanded the exception to include engines predating model year 2000. This development led to yet another wave of interest in glider trucks. An operator can now order a new powered glider truck with a pre-emission, pre2000 model year engine, which costs between 15 to 25 percent less than a new factory truck that must comply with the emissions standards and the ELD rule. Glider kits often use either a used engine, a rebuilt (or reconditioned) engine or a remanufactured engine. A used engine may have been removed from a wrecked or disabled vehicle. A rebuilt engine includes most of its original capabilities and parts and therefore maintains its original identity determined by the original serial number. A remanufactured engine consists of the latest specs, capabilities and parts, and therefore it takes on a new identity, including a new serial number and, in many instances, a new warranty. Keep in mind also that not all trucks with a replacement engine are glider trucks, such as a truck that blows an engine and another engine is used from a donor truck. In September 2018, the South Dakota Highway Patrol attended the South Dakota Trucking Association’s Fall Convention. The patrol had a safety booth at this event and provided a demonstration of how it utilizes performance-based brake testers (PBBT) at roadside inspection sites. Capt. John Broers presented a Partnership in Safety Award to Dakota Carriers Inc. for displaying great improvement and maintenance in safety. The South Dakota Highway Patrol also took part in the interview and selection process of the South Dakota Trucking Association’s Driver of the Year, which was awarded to Dan Caneran of K & J Trucking Inc. The South Dakota Highway Patrol was present for the entire three-day convention and we were surprised at the awards banquet when the South Dakota Trucking Association presented the patrol with the Pride of Show Award for the Fall Convention. n TOP LEFT Left to right: Port Manager Vicki Kracht, Port Manager Rhianna Nerby and Sgt. Matt Koll receive the Pride of Show Award. TOP RIGHT Sgt. Matt Koll and Port Manager Rhianna Nerby work the South Dakota Highway Patrol’s safety booth at the South Dakota Trucking Association’s Fall Convention. Cracked frame. Discovered by Ofc. Myrlin Schatz, Montana Motor Carrier Enforcement. Capt. John Broers and Port Manager Rhianna Nerby provide the South Dakota Trucking Association with an explanation of how the patrol utilizes the PBBT at roadside inspection sites. Cracked spring hanger. Discovered by Ofc. Myrlin Schatz, Montana Motor Carrier Enforcement. Broken main leaf spring. Discovered by Ofc. Dan Carroll, Montana Motor Carrier Enforcement. South Dakota Highway Patrol provides a PBBT demonstration. Capt. John Broers presents the Partnership in Safety Award to Dakota Carriers Inc. The Federal Motor Carrier Transportation General Directorate (DGAF, by its Spanish acronym) of the Secretary of Communications and Transportation (SCT, by its Spanish acronym) acted to meet the current needs of the motor carrier industry and increase roadway safety as it relates to the size and weight of vehicles operating on the federal highway system. When talking about roadway safety for the motor carrier industry, it is necessary to emphasize the importance of updating regulations and standards and, by doing so, increasing efficiency while preserving road safety for all users of the federal highway system. In 2018, updates were made on several Official Mexican Standards (NOM, by its Spanish acronym). NOM-012-SCT-2-2017 was one of the most important NOMs updated in 2018. NOM-012 establishes the weight and maximum dimensions with which motor carrier vehicles may operate on the roads and highways under federal jurisdiction. In its latest version, new speed limits were established, as well as new size and weight parameters based on the configuration of each vehicle. NOM-012 also establishes the requirement for motor carrier vehicles to display a valid annual vehicular mechanical inspection decal/permit and pollution emissions inspection. Tractors, known as “fulles” (double-articulated vehicles), must have a decal to show that the tractor, semitrailer and dolly are duly registered with the SCT. In addition to these measures, the fulles are required to have a global positioning system (GPS) that reports at minimum the position and speed of the vehicle. On Dec. 1, 2018, Salomón Elnecavé Korish was appointed director general of the DGAF by SCT Secretary Javier Jiménez Espriú and Under Secretary of Transportation Dr. Carlos Moran Moguel. Elnecavé Korish leads the federal governmental agency that regulates more than 151,908 trucking companies, 20,016 bus and motorcoach companies, and approximately 689,949 federal driver’s license (LFC) holders. Elnecavé Korish possesses extensive experience in the government sector. He has been administrator and director of incomes at the Service of Tax Administration. Prior to that, he led the coordination of engineering and communication at SCT’s infrastructure division. He also worked in the private sector as a consultant in areas such as logistics, transport, quality, organizational design, leadership, among others, and has shared credits on several research papers in fields related to engineering topics in Mexico and Latin America. He has a degree in electro-mechanical engineering from the National Autonomous University of Mexico and has worked extensively within relevant fields, such as research and technology. Training Course for Federal Motor Carrier Inspectors and ‘Train the Trainers’ Mexico’s Federal Police, in cooperation with the Mexican Transportation Institute (IMT), the Federal Motor Carrier Safety Administration (FMCSA) and Mexico’s Secretary of Communication and Transportation, delivered a North American Standard Inspection Part B (NAS B) Course at the IMT’s campus in Pedro Escobedo, Querétaro, Mexico, Aug. 20-24, 2018. Fifty Federal Police commercial motor vehicle inspectors and five SCT commercial motor vehicle inspectors participated in the NAS B Course. The training course is based on CVSA’s out-of-service criteria and Mexico’s vehicle maintenance standard, NOM-068-SCT-2-2014, with the goal to increase motor carrier safety throughout Mexico. CVSA International Roadcheck in Mexico Mexico’s DGAF, alongside the Federal Police, participated in CVSA International Roadcheck, June 5-7, 2018. Commercial motor vehicle inspections were carried out based on Mexico’s vehicle maintenance standard (NOM-068-SCT-2-2014) and CVSA’s out-of-service criteria. This course was conducted with the support of inspectors from SCT’s DGAF: Jacobo Garcia, Luis Merino and Octavio Quiroz, all of whom have been certified by FMCSA’s National Training Center. Updates and Hazmat in Mexico The following courses were carried out: • July 2-6, 2018, a course on the updates of the Regulation for Land Transportation of Hazardous Material and Residues took place, with the participation of all 54 DGAF inspectors. • Aware of the importance of the matter, SCT’s DGAF carried out a course on United Nation’s Recommendations on the Transport of Dangerous Goods, Model Regulations on its 19th revised edition, with a total attendance of 45 DGAF participants. “…UN has developed mechanisms for the harmonization of hazard classification criteria and communication tools, and for transport conditions for all modes for transport.” The course took place July 16- 27, 2018, with a duration of 20 hours. • A workshop was carried out July 2-6, 2018, on the updating of the Infringement Notice format for inspectors of the federal motor carrier and elaboration and filling of the new infraction notice format issued for fixed weight and dimensions’ verification centers. the 25th annual Alberta Commercial Vehicle Enforcement Inspectors Challenge on June 23, 2018. AMTA opened its doors at the facility on Oct. 30, 2018. The AMTA is the first association to have a member-approved facility like this one, which removes training vehicles from public roadways onto the safety of a controlled training track. The facility was constructed to LEED Silver standards and features a green roof and electrical vehicle charging stations. The facility provides AMTA with the opportunity to provide enhanced driver education, as well as be the industry leader in training initiatives. The facility also serves to further strengthen AMTA’s partnerships with government, the Workers Compensation Board and various industry stakeholders. These are exciting times in Alberta and for commercial transportation. With 24/7 electronic access and proximity to EIA and Queen Elizabeth II Highway, the AMTA training facility provides a destination for announcements, events, meetings, product launches, research, technology testing and training development and delivery. Disconnected slack adjuster. Photo by Ofc. Brennan Nugent. Watson Lake, Yukon, Canada. • Provide public awareness to drivers • Allow for visibility of non-compliances found on the road By providing a national view of the situations presented on Canada’s roads, the TDG Road Blitz helps to better determine a risk-based approach to enforcement as well as foster better working relationships with commercial vehicle enforcement officers (CVEO) nationwide. TDG inspector stands beside a parked highway tank with a UN1203 placard. COHMED Conference Attendees Receive Specialized Training on Hazardous Materials/Dangerous Goods Transportation Safety More than 250 individuals involved in the regulation, enforcement and safety of hazardous materials/dangerous goods transportation attended the Cooperative Hazardous Materials Enforcement Development (COHMED) Conference, Jan. 28-Feb. 1, 2019, in San Antonio, Texas. Hosted by the Commercial Vehicle Safety Alliance (CVSA), with support from the Pipeline and Hazardous Materials Safety Administration (PHMSA), the COHMED Conference is an annual five-day event providing specialized technical training and instruction to individuals representing organizations and agencies responsible for regulating and enforcing the safe transportation of hazardous materials and dangerous goods, along with industry stakeholders. Hazardous materials specialists, law enforcement personnel, trucking companies and associations, interest groups and private industry attended the COHMED Conference to receive proactive and progressive training on highly specialized issues; discuss and address concerns related to hazardous materials/ dangerous goods regulations and enforcement; share perspectives; and provide input into future changes and regulations. This is TAT’s tractor-trailer anti-trafficking educational museum. The United Nations defines “trafficking in persons” or “human trafficking” as the recruitment, transportation, transfer, harboring or receipt of persons by force, coercion, abduction, fraud, deception, etc., to control a person for the purpose of exploitation, such as sexual exploitation or forced labor. The International Labour Organization estimates that forced labor and human trafficking is a $150 billion industry worldwide. In 2017, the U.S. National Human Trafficking Hotline received reports of 8,524 suspected human trafficking cases. In Canada, there were 340 incidents of human trafficking in 2016, according to police-reported data. A number of special guests spoke at the press conference. TAT Executive Director and Co-Founder Kendis Paris addressed the crowd. TAT held a press conference on Jan. 15, 2019, in Washington, D.C.
Jan. 11, 2019, was Wear Blue Day and CVSA staff demonstrated its solidarity with victims of human trafficking by wearing blue and contributing on social media using #WearBlueDay. Don’t miss your opportunity to join your colleagues at this year’s most important gathering of the commercial motor vehicle safety community. Together, we make a difference and save lives. For more information and to register, visit www.cvsa.org/ eventpage/events/cvsa-annualconference-and-exhibition. As the new Congress convened in January, it did so in the midst of a partial shutdown of the federal government, as lawmakers were not able to come to agreement over funding for the president’s proposed border wall. The shutdown forced furloughs throughout the U.S. Department of Transportation; however the Federal Motor Carrier Safety Administration (FMCSA) was not directly impacted, as the agency is funded through the Highway Trust Fund. However, the shutdown did have an impact on the agency’s work, including publication of regulatory items in the “Federal Register” and other initiatives, as various segments of the approvals and review processes were impacted by the shutdown. The shutdown, the longest in U.S. history, ended on Jan. 26, when Congress agreed to a continuing resolution through Feb. 15, at which point lawmakers were able to come to a compromise agreement on an omnibus appropriations package that funds the remaining federal agencies through the end of the fiscal year. Despite the shutdown, the 116th Congress convened in early January and quickly got to work on a number of initiatives. First, both chambers finished making necessary changes to committee assignments. As expected, Senator Wicker (R-MS) assumed the gavel on the Senate Committee on Commerce, Science, and Transportation. Senator Fischer (R-NE) retained her role as chair of the subcommittee that handles motor carrier safety issues. Meanwhile, Senator Cantwell (D-WA) has taken over as ranking member of the full committee and Senator Duckworth (D-IL) will serve as the new ranking member of the Transportation and Safety Subcommittee. CVSA is paying close attention to the impacts that the current approach of using continuing resolutions to provide federal funding is having on the jurisdictions. Input from the membership has indicated that the lack of consistent, reliable, year-long funding is making it more difficult for states to plan their programs, fill positions and implement strategies. As the motor carrier industry continues to grow, we need to see more enforcement, not less, and CVSA will be working with the states, FMCSA and Congress to find ways to provide jurisdictions with the funding stability necessary to maintain robust, effective, long-term programs. On the House side, Congressman DeFazio (D-OR) has taken over as chairman of the Transportation and Infrastructure Committee and Congressman Graves (R-MO) will serve as the full committee’s ranking member. Congresswoman Norton (D-DC) and Congressman Davis (R-IL) will serve as chair and ranking member, respectively, for the Highways and Transit Subcommittee. Congress Focuses on Transportation Initiatives With committee assignments resolved and leadership in place, work began quickly on a number of transportation initiatives. Talks continued on Capitol Hill regarding the potential for an infrastructure package. Details on the scope of such a package were still being negotiated in mid-February, though leadership on the House side indicated that a framework would likely be released in the late spring. Both the House and Senate held hearings on the need to invest in infrastructure. Work has also begun on the next highway reauthorization bill. While the process is still in its very early stages, members are beginning to meet with constituents and stakeholder groups to discuss priorities and potential recommendations. A handful of bills have already been introduced that will likely be wrapped into the discussions as well. It remains to be seen how a potential infrastructure bill might impact the next highway reauthorization. In preparation for these discussions, the CVSA Reauthorization Task Force, which has been tasked with evaluating implementation of the Fixing America’s Surface Transportation (FAST) Act and recommending changes in policy that will improve motor carrier safety and enforcement programs and efforts, continued its work through the winter. A survey was developed and sent to Class I Members, Class II Local Members and Class III Associate Members to gather input on a variety of issues and concerns. In May, members of the task force will meet in Washington, D.C., to discuss implementation of the FAST Act and its impact on the jurisdictions’ Motor Carrier Safety Assistance Program (MCSAP) activities and motor carrier enforcement and safety. The group will also talk with stakeholders and discuss potential recommended changes to MCSAP and motor carrier enforcement programs. The group will meet for two days and provide feedback to CVSA and FMCSA on opportunities for improvements. The Federal Motor Carrier Safety Administration (FMCSA) relies on data to inform safety decisions that drive the agency’s effectiveness toward improving commercial motor vehicle safety. In existence since 2005, FMCSA’s Data Quality Program systematically identifies and continually implements enhancements to improve the quality of its vital safety data. Working in partnership with FMCSA, states submit accurate and comprehensive crash and inspection data, which the agency uses to focus efforts to improve safety. FMCSA is committed to improving the quality of large truck and bus safety data through our Data Quality Program. Today, FMCSA’s Data Quality Program continues to take a responsive approach to data quality improvement by listening to feedback from our state partners and delivering new tools and comprehensive training to support them in their data quality improvement efforts. This includes training, conducted in partnership with CVSA, including online training and oneon-one assistance from the program’s data quality specialists who provide the states with analysis, tools and guidance. Each month, FMCSA gives each state a performance measure rating based on the accuracy, timeliness and completeness of their reporting of crash and inspection data. CVSA Data Management, Quality and FMCSA Systems Training took place Jan. 29-31, 2019, in San Antonio, Texas. allows state users to dig deeper into the data by breaking down state measures into monthly snapshots and trends. FMCSA released another tool called the “Leading Indicator,” which provides a threemonth forecast to help states detect problems before they impact the full 12-month measures. To help the states understand their results and how these tools can improve their measures, the program’s data quality specialists work one-on-one with their states to monitor their data quality, answer questions and offer improvement assistance. The data quality specialists not only provide technical assistance, but they engage state contacts to ensure the state users’ needs remain top priority. The Data Quality Program is also available to provide long-distance and on-site support for a state’s crash data collection process. The team has helped numerous states with the selection and extraction logic to SAFETYNET, and provided training for law enforcement personnel and data managers. 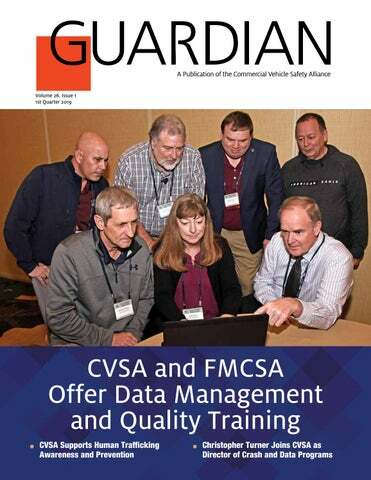 The 2019 CVSA Data Management, Quality, and FMCSA Systems Training occurred Jan. 2931, 2019, in San Antonio, Texas, and provided an opportunity for state partners to learn about how to more effectively use FMCSA systems in their day-to-day work to improve data quality. Offered in partnership with CVSA, state and federal instructors led the training, contributing their invaluable expertise and knowledge. During the training, states were able to connect with their data quality specialists in-person and discuss feedback or questions. The incredible turnout at the event demonstrates federal and state commitment to data quality. To read more about the training workshop, check out page 24. To provide more training opportunities to states, FMCSA is now offering online training courses on the data quality website for FMCSA Portal users. By Frank Rosales, National Training Center, and Donnice Wagoner, Enforcement Division, Federal Motor Carrier Safety Administration, U.S. Department of Transportation The Federal Motor Carrier Safety Administration (FMCSA) is continuing its efforts to provide the most up-to-date training on electronic logging devices (ELDs) to federal and state Motor Carrier Safety Assistance Program partners, and local law enforcement personnel who perform roadside safety inspections. These training resources allow enforcement personnel access to the latest FMCSA policy guidance as it applies to using ELDs during the roadside review of a driver’s compliance with hours-of-service (HOS) regulations. The ELDs – Roadside Course is designed to provide students with a basic understanding of ELD technology and how to interpret the recorded HOS data to determine compliance with HOS rules. The course is structured to guide students through the steps of conducting an inspection on a driver who uses an ELD, including, first determining if the driver is subject to HOS regulations and, second, verifying that the device is on FMCSA’s list of registered, selfcertified devices. Students learn the procedures for ensuring that drivers carry all required in-vehicle ELD information, as well as driver responsibilities, including what they must do should an ELD malfunction occur. The course also provides information covering special driving categories. For more information on the ELDs – Roadside Course, visit www.fmcsa.dot.gov/ national-training-center. The Introduction to ELDs and eRODS (Electronic Record of Duty Status) eLearning Course provides an overview on how to request and review driver HOS data to determine compliance with HOS regulations while conducting a roadside driver inspection. Topics include: distinguishing ELDs from automatic onboard recording devices (AOBRDs); determining the method of transferring ELD data; and locating, opening and reviewing ELD files in the eRODS software. This online course is for roadside inspectors, as well as safety investigators and auditors. Students can focus on the information most relevant to them and can access additional resources for more in-depth information and resources. Course information is available at https:// eld.fmcsa.dot.gov/Enforcement, under the Field Resources tab. Enforcement personnel must log into the ELD Field Resource Center to access resources, including the Introduction to ELDs and eRODS eLearning courses. This article will quote the U.S. Hazardous Materials Regulations (HMRs) as it relates to more frequent recurrent training; however, the same reasoning can be applied for Transport Canada’s Transportation of Dangerous Goods (TDG) regulations and Mexico’s Secretaría de Comunicaciones y Transportes (SCT) (Ministry of Communications and Transportation) regulations. 49 CFR § 172, Subpart H, prescribes requirements for training hazardous materials (hazmat) employees. Additionally, modal-specific training requirements are found in 174, 175, 176 and 177. These requirements are in addition to those prescribed by other federal organizations, e.g., Occupational Safety and Health Administration, Environmental Protection Agency, etc. After the initial training requirements are completed per § 172.704, it further states that a hazmat employee must receive the training required by this subpart at least once every three years. Additionally, recurrent in-depth security training is required once every three years, unless something in the security plan changes, then the security training needs to be updated. So, that’s it? Just once every three years for all, except in-depth security training should the security plan change? Not so fast. If we look closer at § 172.704, we’ll see that the training requirements state in § 172.704(a)(1) and (2) “…the requirements of this subchapter.” So, if the requirements change before the end of the three-year recurrent training requirement, then, per the regulations, you would need training on the relevant changes in both general awareness/familiarization and function-specific requirements. Since the HM-215 (Harmonization with International Standards) series of rulemakings are on a two-year cycle, and just about every part within Subchapter C is always “touched,” it could be considered that the required recurrent training just went from a three-year cycle to a two-year cycle. Throw into that all the other series of rulemakings and updates of relevant special permits, safety data sheets and emergency response information, then that two-year cycle just might not be enough and we should now consider a one-year recurrent training cycle. A one-year recurrent training cycle? Are you delusional? Do you know what that will cost? Well, no, I don’t know what it will cost. Cost will vary depending on how much changes year to year. As a retired Kansas State Patrol trooper with 22 years of hazmat enforcement experience, I can tell you that hazardous materials/dangerous goods carriers stopped for inspections who fail to keep up with current regulatory requirements spend more time on said roadside inspections as the inspector writes out the violations and/or citations and/or out-of-service orders. I do know that if an incident should occur, federal regulators will not be kind should they discover non-compliance led to enhanced consequences of said incident. I do know that if an incident should occur and you’re non-compliant of even the smallest of regulations, your liability on the civil side is greatly enhanced. So, I ask this question – What is the true cost of not staying current with all relevant changes should an incident lead to serious injuries and/or fatalities because it cost too much to keep up with all the changes on a yearly basis? CVSA Operational Policy 4 states that an inspector “shall attend minimum in-service/refresher training covering inspection of drivers and vehicles; North American Standard Out-of-Service Criteria; inspection of hazardous materials/dangerous goods, inspection of cargo tanks, other bulk package inspections and passenger carrier vehicle inspections as applicable, annually.” Some jurisdictions require a minimum of 12 hours per year for the nonhazmat inspector and an additional eight hours for certified hazmat inspectors. Although training requirements will vary from jurisdiction to jurisdiction, inspectors are still receiving updated training annually. Remember, inspectors enforce all federal safety regulations, hazmat regulations and jurisdictional laws and regulations, so I can see where 12+ hours of annual training might be needed. But for motor carriers and shippers, their slice of the regulatory pie is smaller and annual updated training/testing might only require four hours or less. Additionally, with today’s technology, this training could be done remotely via self-paced online courses/updates, which would eliminate some cost. What is the true cost of not staying current with all relevant changes should an incident lead to serious injuries and/ or fatalities because it cost too much to keep up with all the changes on a yearly basis? UMassSafe, a multidisciplinary traffic safety research program housed in the University of Massachusetts Transportation Center at the University of Massachusetts Amherst, recently launched its Commercial VehicleSafety Technical Assistance Center (CV-STAC) for the Federal Motor Carrier Safety Administration (FMCSA) Eastern Service Center. If those who enforce the regulations need to keep current, shouldn’t those who put the regulations into practice also work to stay current? Not only because the regulations require it, but because it’s the right thing to do. A few years ago, I wrote an article titled “Zero is Not Taboo.” In that article, I told inspectors that the goal of regulators, enforcement and industry – outside of zero fatalities, injuries and crashes – is to have inspections with zero violations. If carriers and shippers don’t keep abreast of relevant regulatory changes, then the “road to zero” will never happen. The safe transportation of hazardous materials/dangerous goods is like a three-legged stool. Remove one leg and the stool will fail, just like the goal for the safe transportation of hazardous materials/dangerous goods. If shippers and carriers don’t do their part, the three-legged stool will never stand. Finally, if you say “rules, rules, rules, there are too many rules,” then don’t stay silent during the rulemaking process. When the Pipeline and Hazardous Materials Safety Administration or other federal agencies post advance notices of proposed rulemakings, notices of proposed rulemakings or other items in the Federal Register and ask for comments, speak up and tell them your thoughts about what they’re asking/proposing. The more feedback the regulators get, the better informed they are about what industry is thinking and the potential cost or hardships a proposed rule or other notice might cause. If you don’t believe that regulators listen, then just read some of the final rules. Multiple times, you’ll see how industry’s and/or enforcement’s input helped to shape said final rule. Sometimes, the input has even led to the withdrawal of a proposed rule. By Todd Stine, Carbon Express; America’s Road Team Captain; 2017 Professional Tank Truck Driver of the Year Driving hundreds of miles a day gives you an interesting look at a wide array of people, behaviors and personalities. Like the guy with his tablet velcroed to his steering wheel so he could more conveniently watch a movie. Or the woman steering with her knees so that she could use both hands to type on her phone. While these are good examples to share with young drivers to explain unsafe driving practices – and interesting conversation starters – as a truck driver, it makes me feel extremely unsafe to see people texting, watching movies, eating, drinking, messing with the GPS, turning around to reprimand a misbehaving child or any similar action while traveling 70+ miles per hour just feet away from my driver’s side door. And the most troubling piece of this? As I drive across the Northeast United States delivering oil and chemicals as a tank truck driver, it has become quite apparent that distracted driving is increasing. Truck drivers often describe distracted driving as the “glow.” From our elevated position in the cab of the truck, we can see the glow as cars approach us in the side mirror and then confirm that the driver is distracted as they pass us on the left. The glow is especially visible at night when the dangers of distraction are even greater. By my count, I’d estimate that one out of every three cars has a distracted driver. It is that prevalent. brakes and braking in the few hours we spent on the track. 75,000 Lbs. Full Stop The tests consisted of a straight run into the stopping area in a standard 12-foot-wide lane. A pair of orange cones marked the starting point where I was supposed to apply the brakes. Another pair of cones marked the spot where I could come to a stop. A formal FMVSS 121 brake test is done under much stricter conditions with professional test drivers. We started each series of tests with five lowenergy stops from 35 mph with a light to moderate application pressure, maybe 10-20 psi – the kind of stop most drivers would make on a city street. Predictably, there was no discernible difference in performance or handling between the three configurations. The drum and disc trucks stopped in the same distance, give or take a few feet, but that probably had more to do with the way I applied the brakes and when I applied them. I was just eyeballing the start marker. The stops done with disc brakes on the steer axle had a more automotive feel to them and applied more “smoothly.” Drum brakes, on the other hand, applied a bit more aggressively at first because of their self-energizing nature. At moderate speeds and with fairly gentle applications, the difference between the discs and drums was barely noticeable. From there, we went to full-pressure applications (100-120 psi) at 35 mph. Here, the difference between discs and drums was more obvious. For one thing, we started to get some antilock braking system (ABS) activity on the drive axles of both the disc- and drum-equipped trucks. wheel locks, the system releases the pressure at that wheel, allowing it to rotate again before immediately reapplying the brake. If lockup reoccurs, the ABS releases the brake once again. “The amount of torque required to lock a wheel is a moving target dependent on the friction between the tire and pavement, which is further dependent on the tire tread (lug or rib, low-rolling resistance or traction, tread depth, etc. ), the weight on the tire, the coefficient of friction of the road surface and, of course, the condition of the brakes,” Ugo explained. “Very generally speaking, application pressures in the 60-75 psi range are needed to lock a drive or trailer wheel and trigger an ABS event on dry pavement.” We had an old-fashioned analog accelerometer on the cab that showed the G forces experienced in these stops. The moderate stops produced a force of 0.5 G, while the full-pressure stops hit 0.8 G. That’s more than enough to dislodge an unbelted driver from the passenger seat or launch any loose stuff in the cab toward the windshield. Things, such as laptops, suitcases, unsecured TVs, etc., would become projectiles and could do serious damage if they took flight. Here’s something for flatbed haulers to consider: The minimum performance standards for cargo securement devices referred to in the cargo securement regulations require those devices to withstand forces of 0.8 G forward and 0.5 G laterally and to the rear. Based on how the full-application stops threw us tight against the seat belts, 0.8 G forward is a pretty tall order. Performance-wise, both the disc, drum and disc/drum combinations produced similar stopping distances. All produced ABS activity on the drive and trailer wheels. Even after five full-pressure stops from 35 mph, there was little discernible fade in the drum systems. Again, Iâ&#x20AC;&#x2122;d call it a wash at this point; the drums were hanging right in there with the discs. 100+ psi, 60 mph Some interesting things began to happen when we punched the test into high gear with full-pressure applications from 65 mph. Like before, we made at least five stops with each configuration and the brakes became hotter each time, which changed the dynamics of each stop. A test like this comes close to simulating the effect of braking on long downhill grades. Due to the transfer of weight forward during a hard brake event, the trailer axle unloads by several thousand pounds. The drive axles behave similarly but by about half the rate of the trailer. The steer axle, remarkably, assumes most of the transferred weight and can load the axle and the tires briefly up to 18,000 or 19,000 lbs. What was unusual for me in this test exercise was feeling ABS activity on the steer axle brakes. That wouldn’t have happened prior to the reduced stopping distance (RSD) rules, but I felt ABS activity on both the disc-brake-equipped steer axles. The drum brakes reacted early in the stop and then the ABS activity subsided, while the higher-output disc brakes continued triggering ABS events almost until the truck came to a stop. straight through the stop. On a few occasions, after I got used to what was happening, I loosened my grip on the wheel and let it steer freely. The truck stayed perfectly straight. This ABS activity is perfectly normal under the circumstances, but it might be a bit shocking to a driver who doesn’t know what to expect. The general point to all this is that much of the increase in braking force that was required by the RSD rules comes from the steer axle – either the beefier 16.5x5-inch drum brakes with type 24 chambers (up from 15x4 inch with type 20 chambers) or the disc brakes. As for stopping distances between the discand drum-equipped trucks, the all-disc truck stopped in the shortest distance, with the distance decreasing with each stop as the rotors got hotter. Amazingly, one of the stops was less than 200 feet. That’s an amazing 50 feet short of the RSD requirement. The disc/drum truck was consistent in its stopping distance over the five high-speed, high-pressure stops, with the steer-axle discs apparently countering the slight fade from the trailer and drive axles. The trucks used for this test were off-the-shelf Freightliner Cascadias with the company’s standard brake offerings. “came to life” as Ugo put it, it came up with a shorter stop than the previous two. The remaining two stops got slightly longer as the linings had to reach a little further for the expanding drum, pretty much as expected. My Take Away This exercise expanded my knowledge of brakes and the dynamics of braking, thanks to the conversations Ugo and I were had in the cab which deepened my respect for modern braking systems. As for the debate over discs versus drums, I can say that each has its merits and drawbacks. If I was spec’ing a truck with a lot of mountain exposure, it would have discs for sure. As a side note, I’ve seen video footage of the Alpine brake testing Meritor does in the Swiss Alps, where the brake rotors on the truck glow cherry red but the truck still stops. That performance in extreme conditions would weigh heavily on a spec’ing decision. Disc Brakes vs. RSD Drum Brakes Back in 2011, a rule from the National Highway Traffic Safety Administration went into effect requiring 6x4 highway tractors to decrease their stopping distance by 35 percent under prescribed test conditions, from 355 feet to 250 feet. “At the time the reduced stopping distance rule was proposed, drive-axle brakes were already at the edge of what they could accomplish, considering the coefficient of friction between pavement and tire,” explained Mark Ugo, Meritor’s senior test engineer for brakes. “They were already at the threshold where the anti-lock system would kick in to prevent wheel lockup. The only real place brake makers could turn to meet the RSD requirements was the steer axle. RSD basically forced a doubling of the steer axle output torque.” In response, brake manufacturers developed more advanced drum brakes, featuring a longer, wider and thicker lining block, new friction formulations, and larger actuators, in some cases. The result was steer-axle drum brakes that produced more torque, did a better job of dissipating heat and lasted longer under normal conditions. These advanced drum brakes offered fleets the option of staying with less expensive and more familiar drum brakes rather than adopting disc brakes to meet the reduced stopping distance requirements. This screen grab from video footage hardly does justice to the impact of a 0.8 G stop from 60 mph with a full load in less than 200 feet. Today, disc brakes are gaining market share and several original equipment manufacturers now offer them standard at some wheel positions. Discs do come with significant maintenance advantages and there are fewer parts whose failure could result in a failed roadside brake inspection. On the downside, they tend to be heavier and more expensive up front, but that is changing. point, you still have time to find a new vendor. Move on before you get stuck with a noncompliant solution, without other options. A young Bill Reese of the Idaho State Police, who is currently CVSA director of COHMED Pro gram, was awarded his priz e for naming the RAD Inspection News. The prize, a CVSA jacket, was presented to Reese by Jim Daust, CVSA Level VI Program directo r at that time. From Jan. 1-Dec. 31, 2018, there were 926 Level VI Inspections conducted in the United States. Of those Level VI Inspections, 97 percent had no violations. Of the inspections with violations, only 1 percent had an out-ofservice violation. The data continues to show a low percentage of violations for shipments subject to the Level VI Inspection criteria. 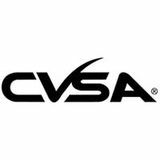 CVSA collects and monitors Level VI Inspection data using the Federal Motor Carrier Safety Administrationâ&#x20AC;&#x2122;s Analysis and Information database. This database collects Level VI Inspection data for shipments of transuranic waste to the Waste Isolation Pilot Plant site, highway route controlled quantities of other U.S. Department of Energy (DOE) shipments, as well as Cobalt-60 shipments made by private industry. Techni-Com Inc. United Motorcoach Association US Ecology Inc. Usher Transport Werner Enterprises Inc.
Admiral Transport Corporation Anderson Trucking Service Inc. DATTCO Inc. Direct ChassisLink Inc. eDriving Fleet LLC FoxFury LLC General Electrodynamics Corporation Geotab Inc.
Transportation Compliance Safety Group Walmart Warren Transport Inc. Western Express Inc.
FRIENDS OF CVSA American Coatings Association Inc. Cassidy’s Transfer & Storage Ltd. Commercial Vehicle Safety Associates of Florida Inc. Envirun Inc.
View the magazine online at www.cvsa.org. For more information and to register, visit www.cvsa.org/eventpage/events/north-american-inspectors-championship.